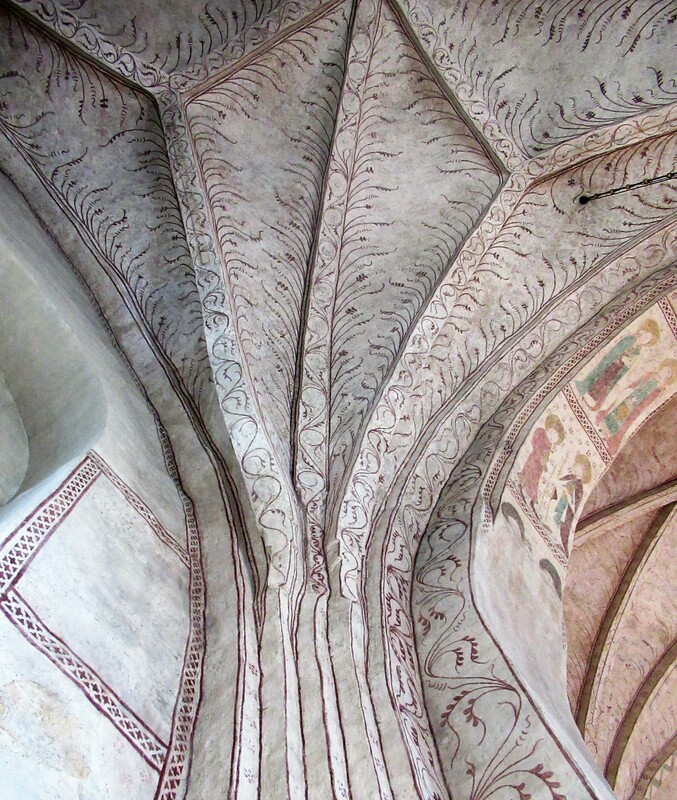 The dead were fast becoming the underlying (sorry) theme of our trip to Uppsala. First it was ancient DNA. 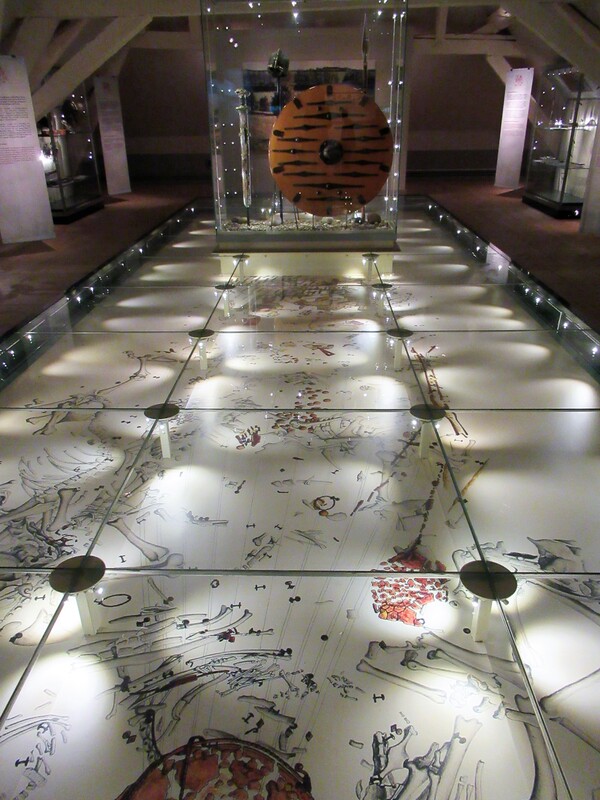 Then, as day two dawned – actually, it was long after dawn – it was the turn of Viking burials. Replete with smoked salmon, mustard sauce and dark brown bread, we set out for the bus. After what felt like miles of tromping – and the sight of the requisite bus heading in the opposite direction – we finally en-bussed. 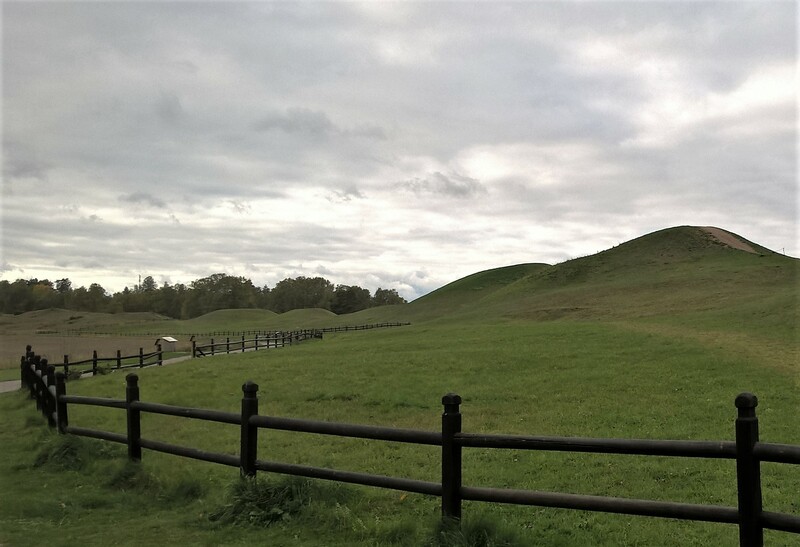 As we headed out of town, to Gamla Uppsala, all seemed set fair. But. We arrived in the outer suburbs, to what looked like a building site. And no obvious signs. Had we reached the wrong place? There was the museum. Buzzing with children … behind a locked door. A little boy indicated we should wait and we’d be let in. We were. Only to be told the museum was shut. ‘But we’ve come from England to see this,’ I exaggerated. ‘You can come back tomorrow,’ she said, smiling. I didn’t return the smile. Stomping down a track the real goal came into view. A trail of mounds. As I sit here typing, at 2.35 am, in the close, dark time of the night (snuffles keeping me awake), thinking of those mounds, I begin to feel the magic. Thoughts of sleeping lords and ladies, of dragons and hideous trolls (the real kind), of monsters, spells and… well, you get the idea. But at the time, I was becoming more and more grumpy. I’ve not only seen lots of mounds. I’ve climbed lots of mounds. Like Etowah Indian Mounds, Alabama. Awesome, #biggly mounds. So this string of hummocks, like the knotty spinal cord of great a sleeping giant, was tempting. But the sign said to keep to the paths. So, with an ill, will we did. Unlike the locals. Or their dogs. By now even the archaeologist was more interested in a nearby church than mounds behind fences, so off we set. 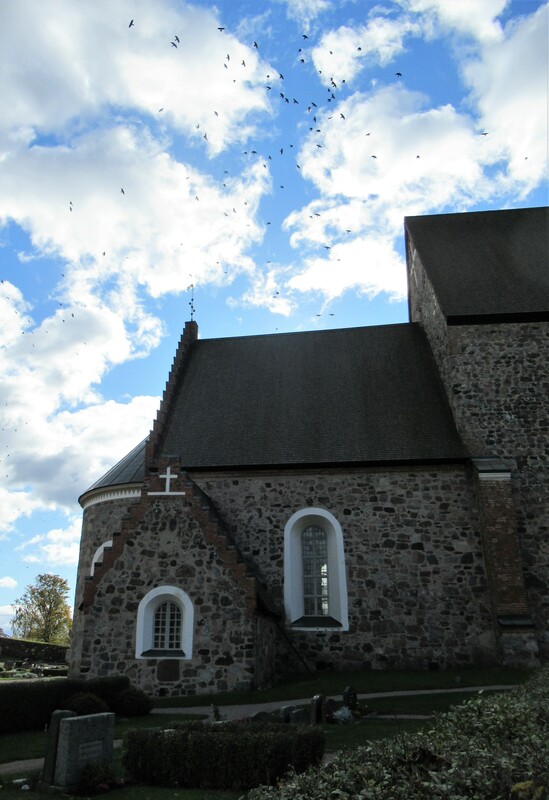 Why do rooks and ravens find churches such a magnet I wonder? ‘A funeral is in progress,’ read the sign. For a moment we thought our run of bad luck was continuing. But the church was empty. Then a man began vacuuming the aisle. The church was a delight. 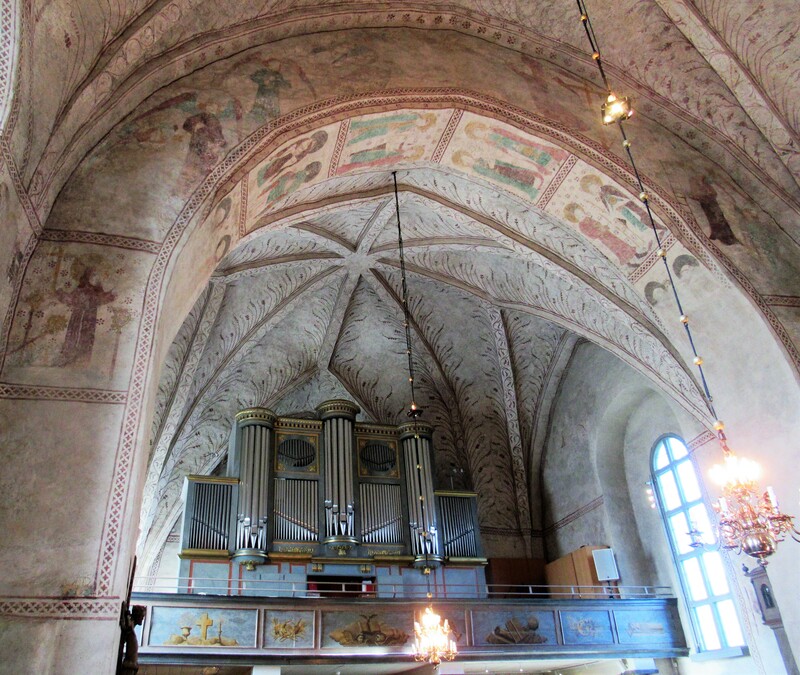 I’d thought, on our last trip to Uppsala, that the painted church and cathedral were unusual, but perhaps not. After much oohing and aahing over the paintings behind the organ, out we went, into the graveyard, to scrutinise an odd building we’d seen from a distance. 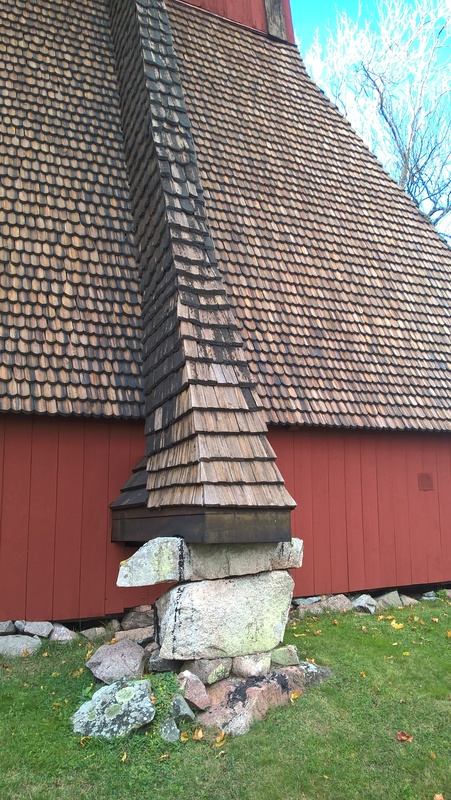 It had fascinating wooden shingles and appeared to be resting on lumps of stone. There was no clue to its function. If you know what this is please comment and tell me, It has a face, don’t you think? As we puzzled, the unmistakable sound of digging arose. Not an archaeologist at work, but a new grave in the making. It was turning chillier, both physically and spiritually. 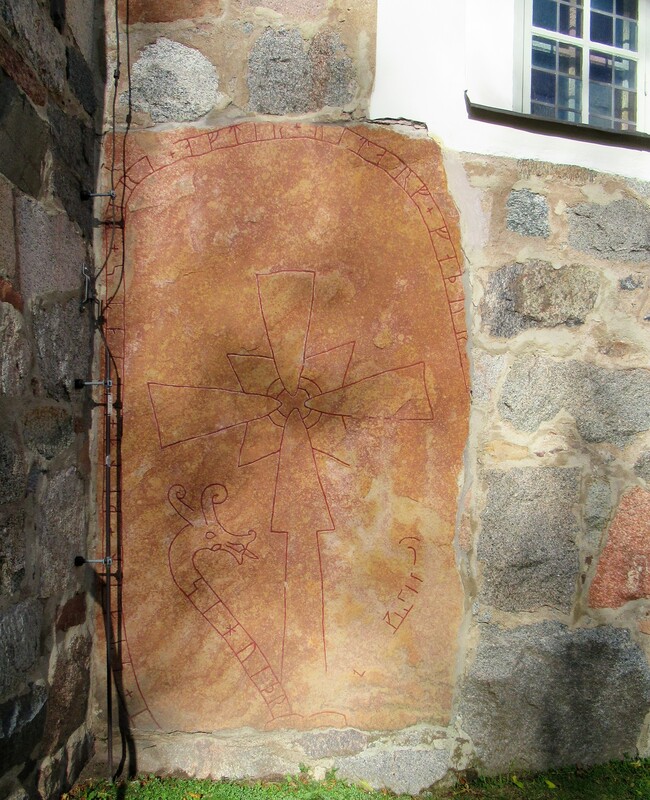 We hurried to investigate the remainder of the church exterior, where one more treasure lay in store: a rune stone built into the wall. Despite the robust breakfast, lunch was now sounding tempting. We took the bus back to town (and there’s a tale for another day, perhaps, of immigrants and liberals). A vegetarian buffet, all we could eat for 99 krone, set us up nicely for the next brush with death. 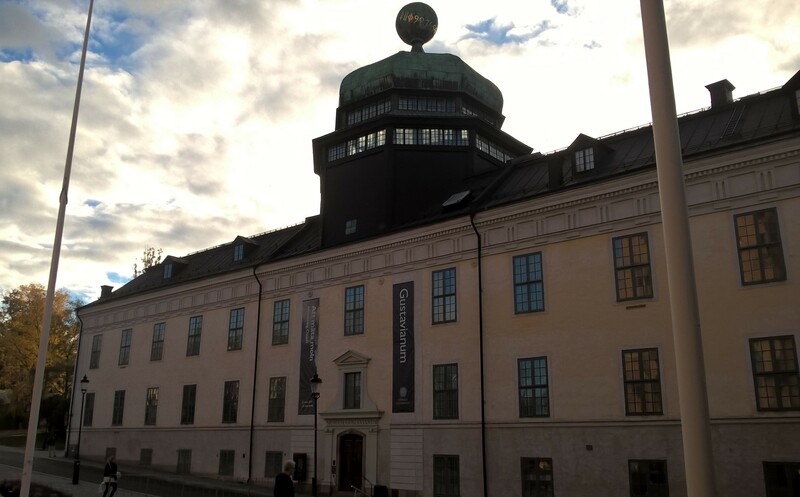 The University’s Gustavianum Museum is an intriguing landmark of a building. 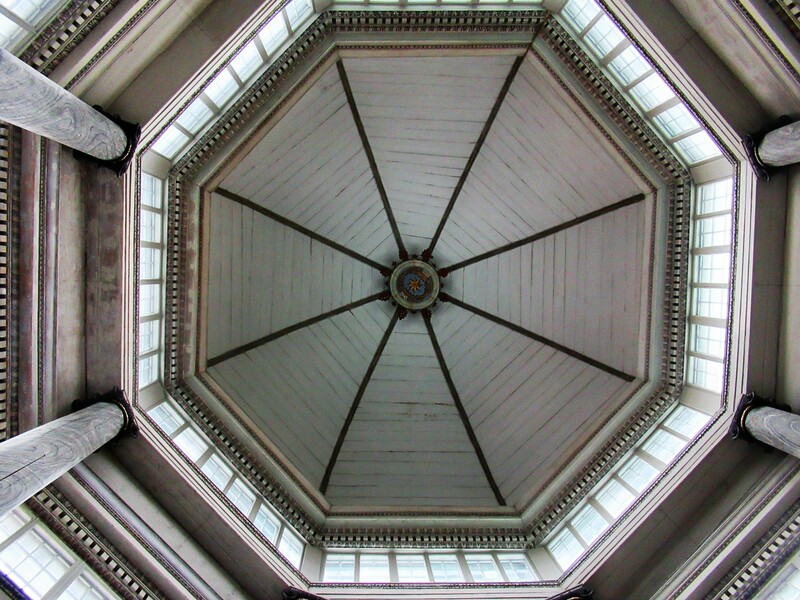 Its distinctive cupola sets it apart from the other buildings around it – no mean feat given the massive spires of the cathedral. But it is what’s inside that’s really impressive. I must confess we didn’t ‘do’ the Egyptian stuff, or even the Augsburg Art Cabinet. We did the deathly bits. 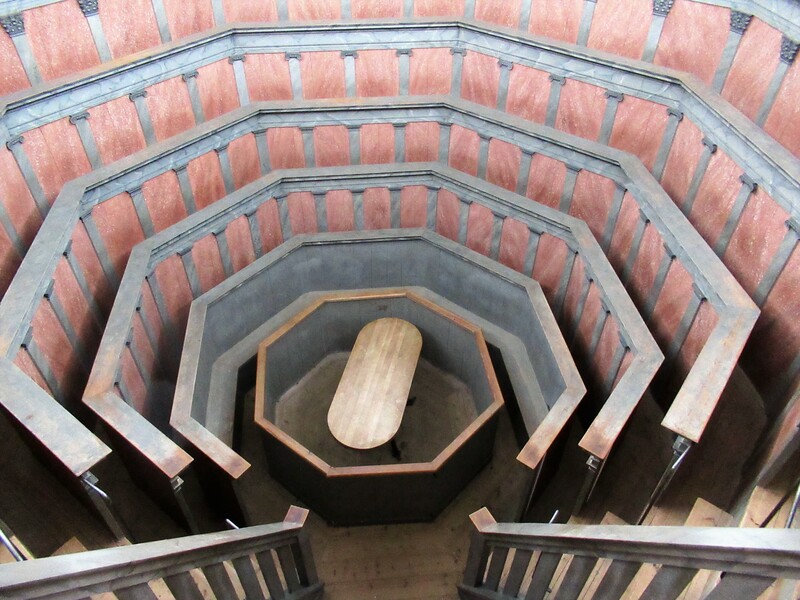 First the octagonal seventeenth-century dissection theatre. Which was spectacular – and scarily vertiginous. 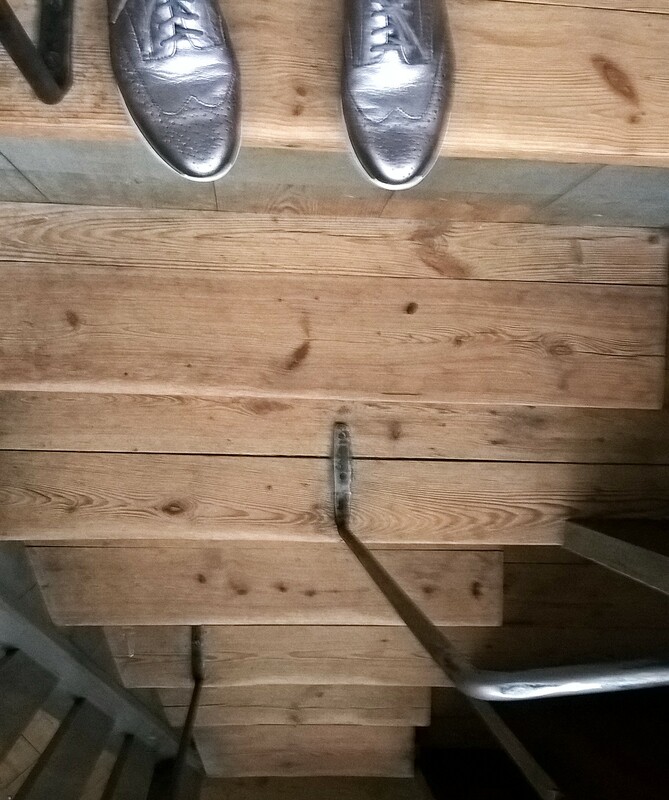 Climbing huge steps to the top tier of the viewing galleries was bad enough, descending would have been perilous without the iron handrails. Nearly got it all in! 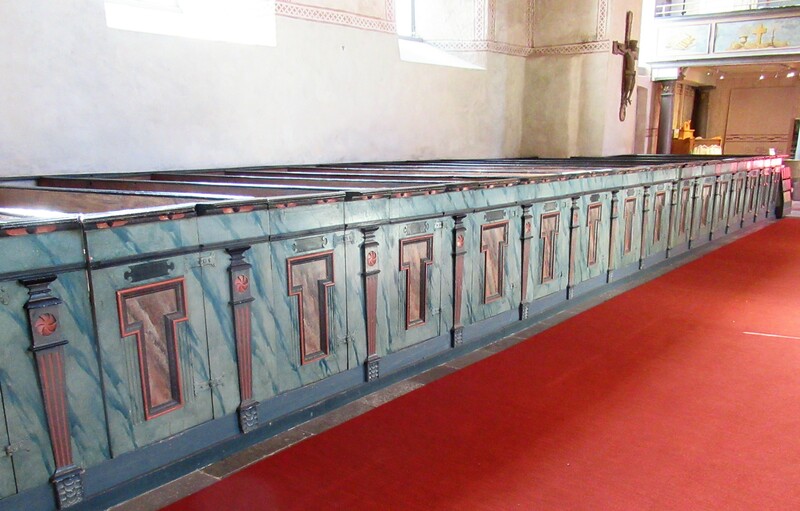 I imagine the narrowness of the gap between the barriers and standing spaces – there were no seats – was to stop people falling over when they fainted during dissections of the criminal corpses. Because Professor Rudbeck’s intention was to allow students and member of the public to see, smell and taste the dissection of the corpses. But the highlight of the day was still to come. The best archaeological exhibition I’ve ever seen. Old hazy black and white pictures – of the excavation of a Viking boat burial at Valsgärde, between the 1920s and early 1950s – had been melded together to form a slow-moving video, totally capturing the essence of the excavations. Pipe-smoking men in white caps and knickerbockers. Women in dungarees. Diligently recording the resurrection of a burial. An intimate glimpse of their lives and work and fun. Turning to a large area covered in glass, lit from beneath in the dimly-lit gallery, I saw two children take off their shoes and walk on the glass. I looked closer. Sure enough, there was a boot jack to take off your shoes and images of feet on the edge of the glass. 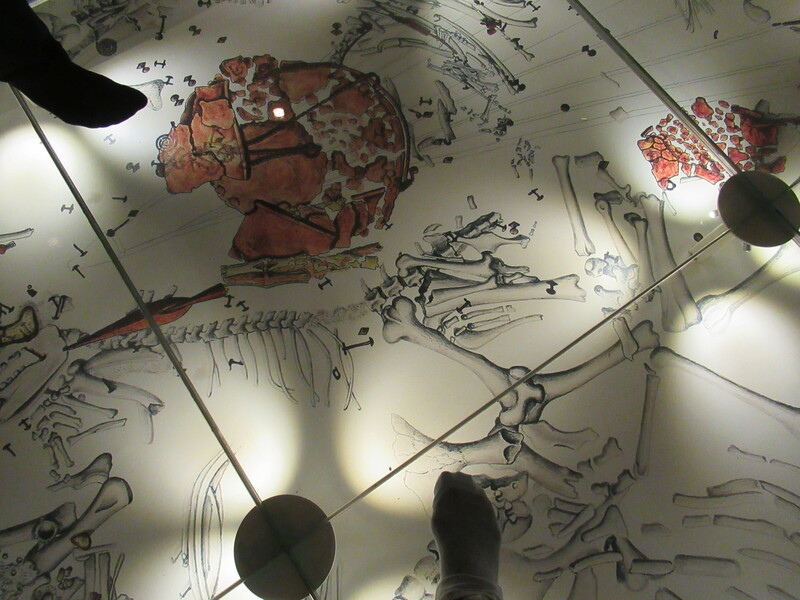 The whole ship burial was underneath us – not the real thing obviously, but the site illustrated in graphic format just as the archaeologists had found and recorded it. There were some real finds in place, such as the rivets – which threw shadows over the two-dimensional lines of the illustration. There were swords, a shield a helmet. Gaming marbles. 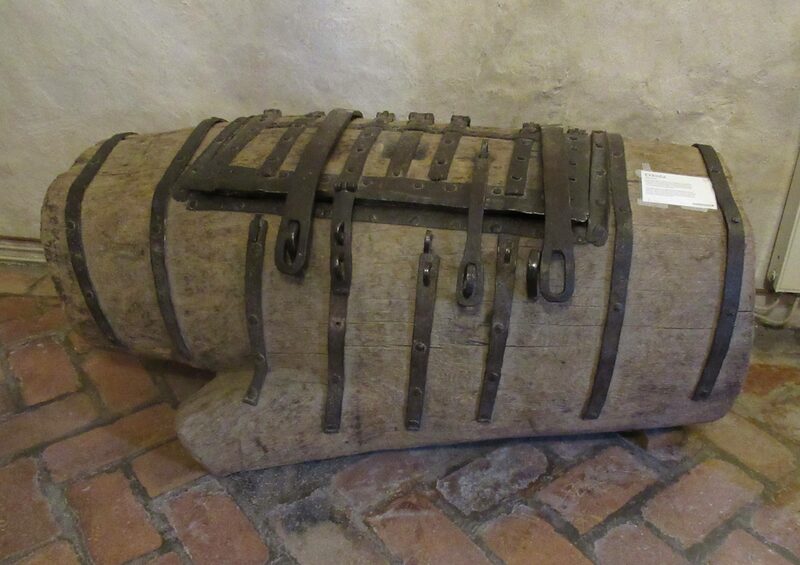 A drinking horn, a dog’s collar, a horse’s harness, fire irons… so many delights – too many to share. 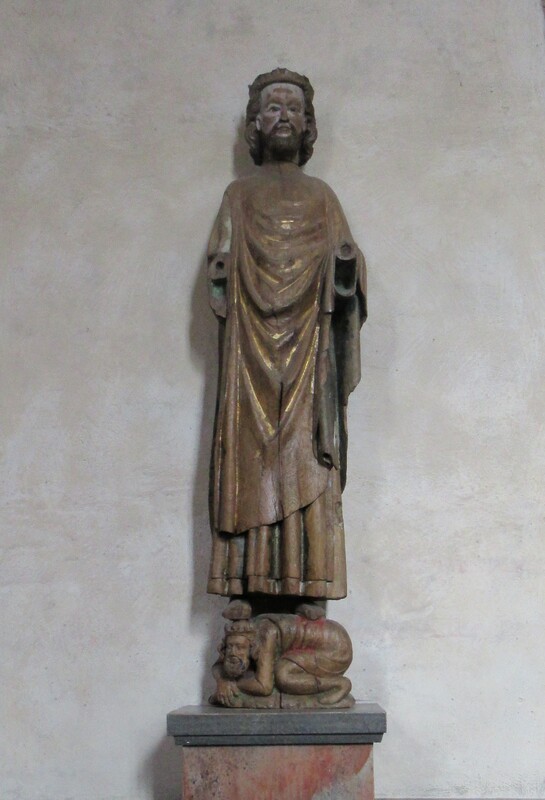 And anyway, hard to take decent images with a compact camera and no flash (that’s my excuse!). I found it hard to tear myself away. But we did, for the day was not yet over. More to do, more to see. It wasn’t till later I thought, I’m not sure about this digging-up-the-dead lark. I’ll leave it there for now. So, adjo, till the next instalment. When there may be chocolate. 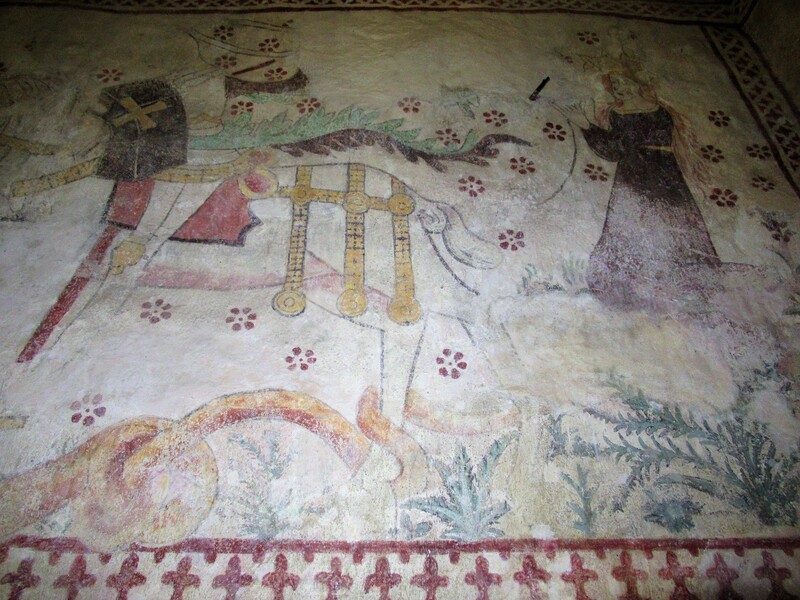 This entry was posted in Art, jaunts & going out, Sweden, Travelling and tagged Archaeology, burial mounds, church paintings, dissection theatre, Gamla Uppsala, Gustavianum, rune stone, St Erik, Uppsala University Museum, Valsgärde, Vikings. Bookmark the permalink. What an ungracious museum guardian…she needs a troop of Hattifatteners to arrive during a thunderstorm. I would have enjoyed the excavation video and the mock up of the excavation site, but do not somehow think I would have been walking over it either. Oh, Helen, what you would have missed! It was odd but really wonderful walking on the glass. And I agree about the Hattifatteners. Moominmamma would have let us in and probably fed us too after our long journey. This is absolutely amazing. Your photos are wonderful. 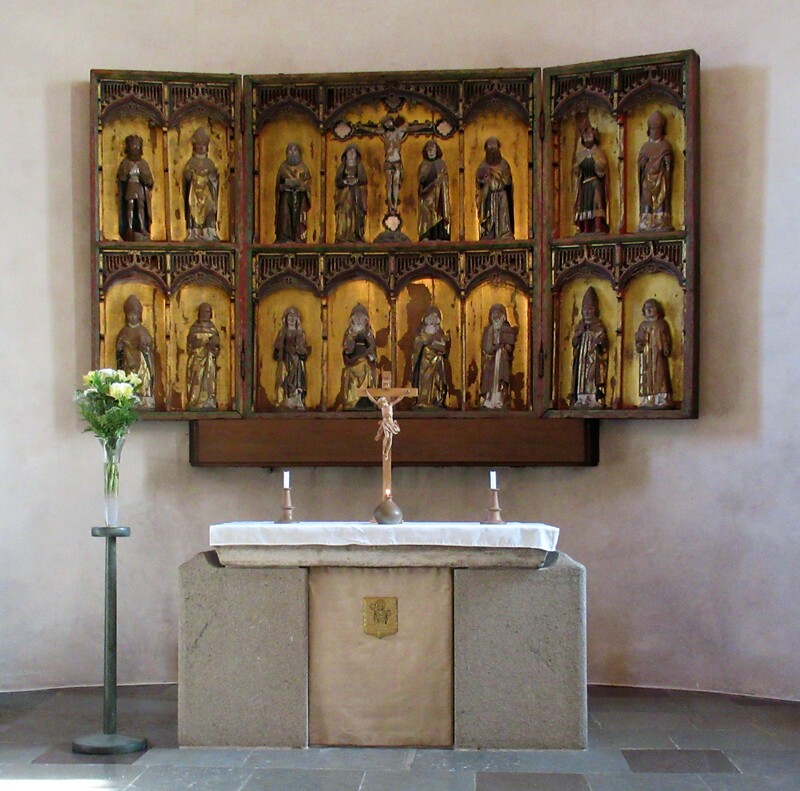 I love the altar in the church. 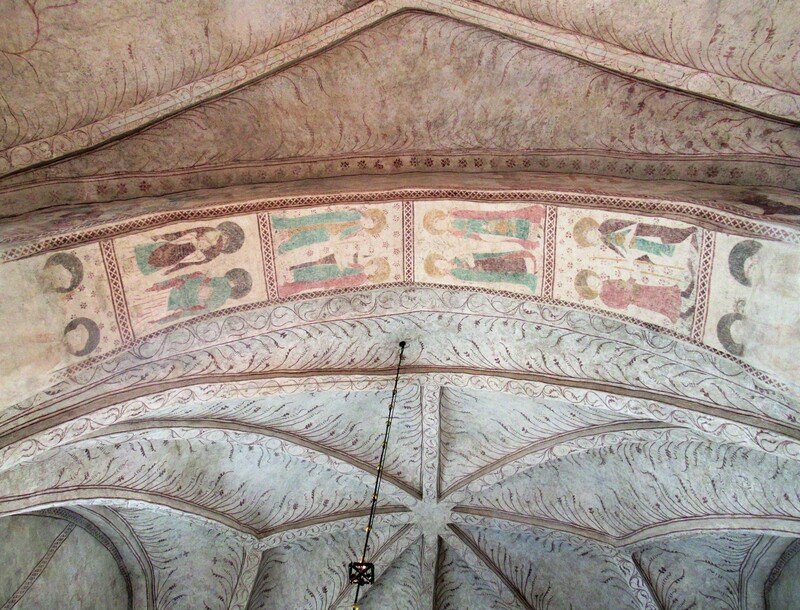 And the decoration of the columns and ceilings look like grasses blowing in the wind. The dissecting theater…amazing. 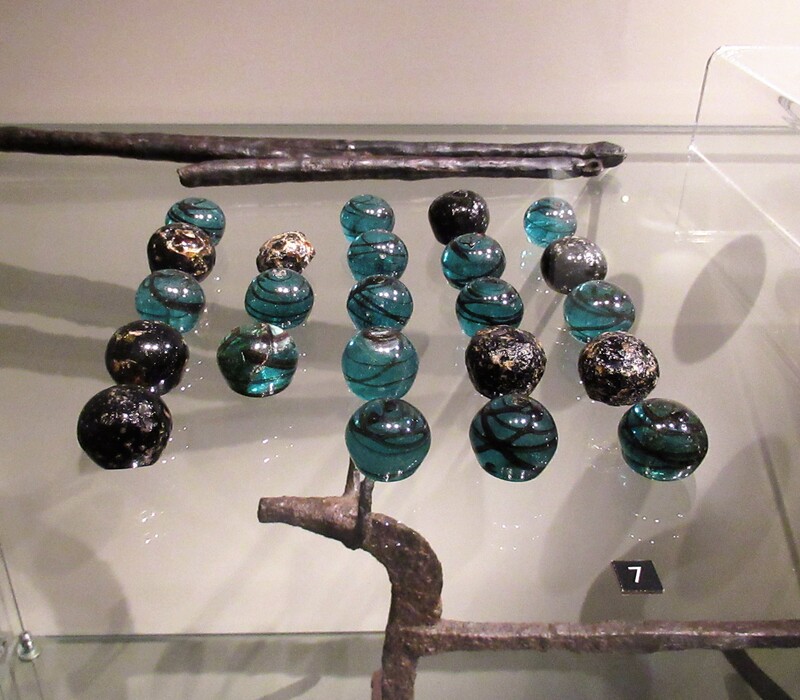 I think how creatively Viking burial display was arranged. Wow! I’m so glad you felt the magic – I thought the pics were a bit disappointing but yes, the Viking burial thing was awesome. The feeling of walking over it in socks in the dim light – especially when you’ve done so many digs – to see it all laid out so beautifully. Ahh! This is just so cool I can’t stand it. 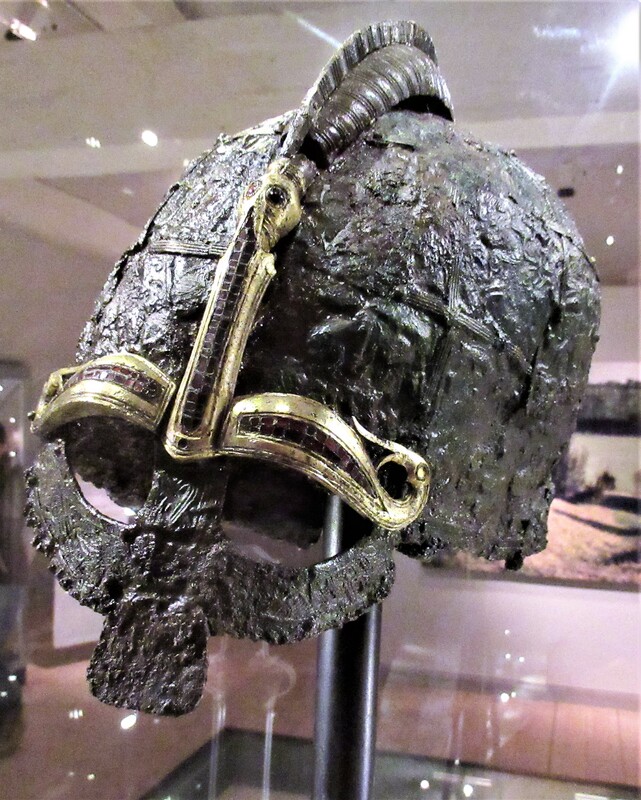 Fabulous helmet and sword hilt. Glad you liked it – wish I could have shown you the dog collar, given your interests 😉 but it was a terrible picture! Never been to Gamla – sounds interesting. Shame the museum was closed (and yes, the curator was rude!). Hope you found Moomins and chocolate! Is it past the Science buildings? If so, I MIGHT have been there visiting a friend who has a house outside the city. We went for a walk among the mounds just before dinner. But, I don’t remember any museums. 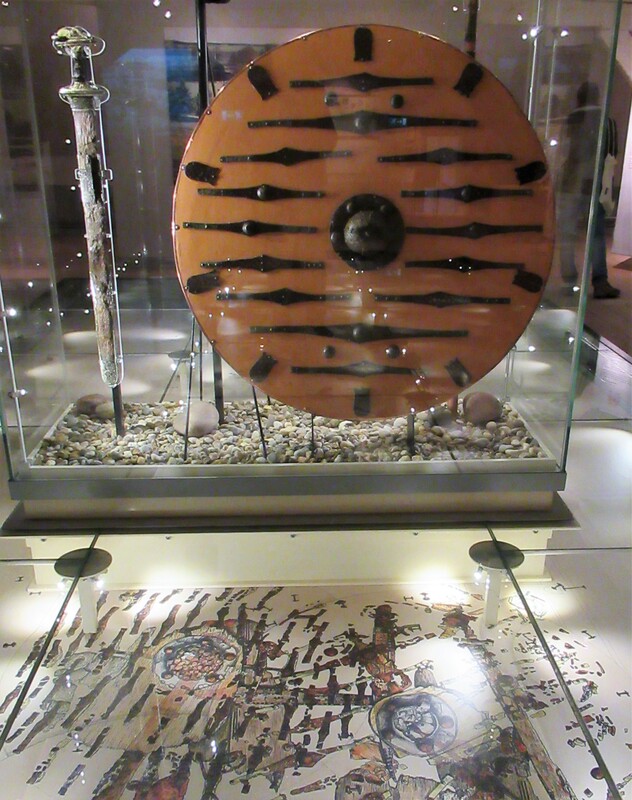 The Gamla Uppsala museum is worth a visit, they have free guided tours a couple of times a day, lets hope you get in next time. 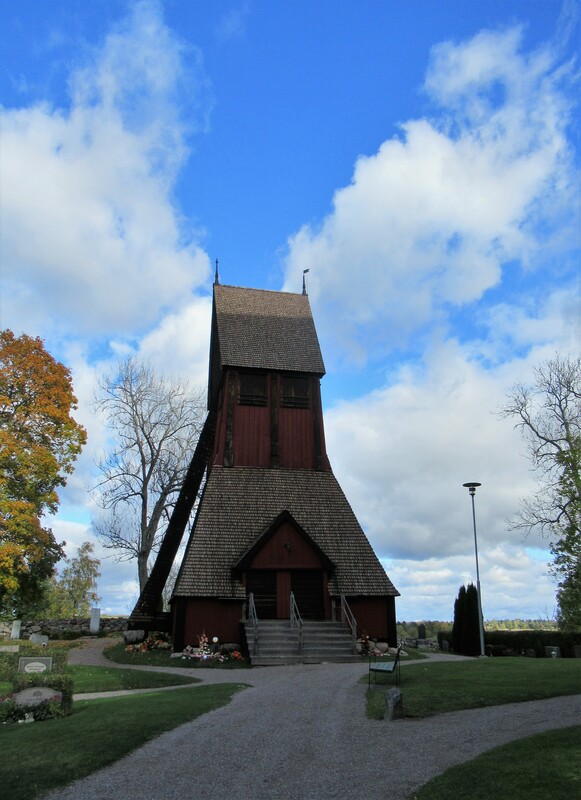 The wooden building by the church is the bell tower. We flew to Stockholm from Manchester – also easy. 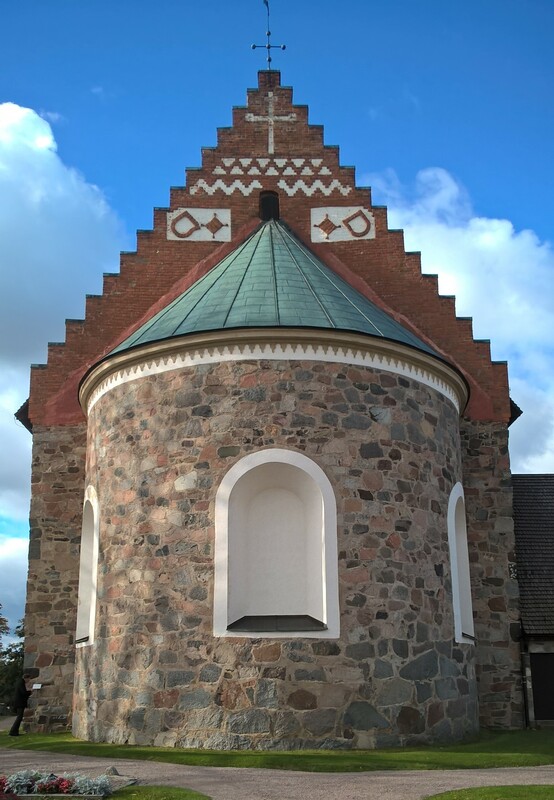 I wondered about the bell tower – thanks for that!